Brief summary of the paper: A central assumption in ecological immunology is that immune responses are costly, with costs manifesting directly (e.g., increases in metabolic rate and increased amino acid usage) or as tradeoffs with other life processes (e.g., reduced growth and reproductive success). Across taxa, host longevity, timing of maturity, and reproductive effort affect the organization of immune systems. It is reasonable, therefore, to expect that these and related factors should also affect immune activation costs. Specifically, species that spread their breeding efforts over a long lifetime should experience lower immune costs than those that mature and breed quickly and die comparatively early. Likewise, body mass should affect immune costs, as body size affects the extent to which hosts are exposed to parasites as well as how hosts can combat infections (via its effects on metabolic rates and other factors). 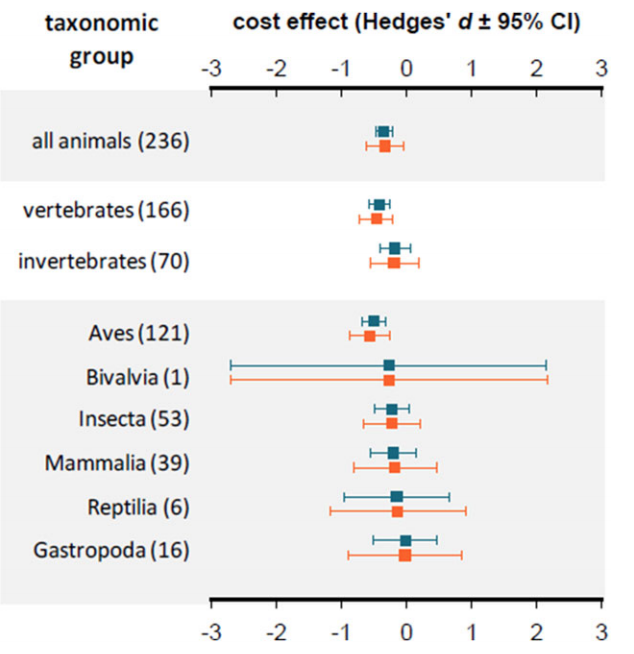 Here, we used phylogenetic meta-regression to reveal that, in general, animals incur costs of immune activation, but small species that are relatively long-lived incur the largest costs. These patterns probably arise because of the relative need for defense when infection risk is comparatively high and fitness can only be realized over a comparatively long period. However, given the diversity of species considered here and the overall modest effects of body mass and life history on immune costs, much more research is necessary before generalizations are appropriate.